Memorizing the addition facts is an important part of early learning. Having all of the facts memorized sets your child up for math success for life. BUT….there’s nothing worse than flash cards! Luckily you can have fun and learn the addition facts at the same time- all it takes is a little change in presentation. If you have a child just starting to memorize his addition facts- here is a free printable game to help learn the 1-3 addition facts. First let me note that this game only deals with the numbers 0,1,2, and 3. I like to keep the memorization sections small- so we learn 0+0 up to 3+3. Then I will add in up to 5+5. Then 7+7 etc. This keeps the amount easily digestible and causes less frustration. The concept is simple. Roll the die, move your piece, answer the fact on the space you land on. Like any addition fact practice, this game relies on repetition. 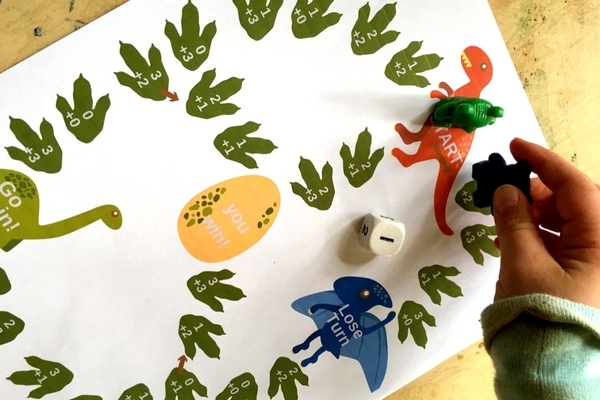 The facts are duplicated through out the track AND getting the exact roll of the die to land on the WIN SPACE takes some time- so you may have to go around a few times before you can finally win the game! Hint: Glue the board to cardboard or laminate it for durability! Have fun and let me know if your kids enjoyed the game!